Keeping Abreast in Victoria: Let's get libraries hooked on our books! Children’s book week is the 16th - 22nd of August 2008. 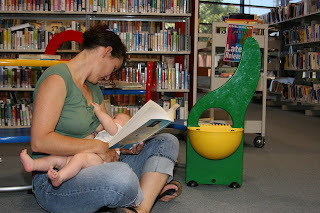 Libraries are a place where mothers and children often hang out - they have story reading and other activities and are an important part of our communities. It's great to keep their "breastfeeding section" up to date. So we are asking groups to consider buying their library a subscription to ABA for one year - so they can sample the great stuff ABA has to offer. It is our hope that they will find it something worth keeping up. For $50 they will get a free copy of "Breastfeeding Naturally" and copies of Essence every 2 months. Coming soon will be a special place on the website where groups can order their subscription for their library. This will allow us to send BFN to you - you may want to make a special presentation to the library- may want to invite the local newspaper along.